Classical academy opened in 1801 and rechartered, 1814. William J. Bingham was principal, 1827-1844. Closed 1858. Campus here. Hillsborough Academy is a name shared by a number of schools in the town of Hillsborough. The first school, never having thrived, operated in an old Anglican Church from 1785 until 1790. The second was established in Hillsborough by 1801. The trustees in 1801 included Walter Alves, William Kirkland, William Whitted, William Cain, and Duncan Cameron. The academy, led by Reverend Andrew Flinn and “a proper assistant,” offered the classics, English, reading, writing, mathematics, geography, bookkeeping, “and the plainer branches of mathematics.” Reverend William Bingham (1754-1826), a native of Ireland who was educated in Scotland, became principal in 1813, but departed by 1815 in order to establish his own school. 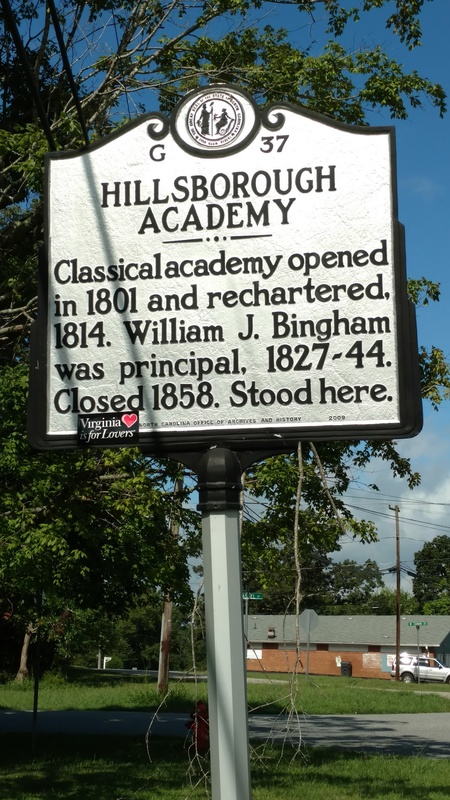 Known as Mount Repose, Bingham’s school was about 10 miles from Hillsborough. 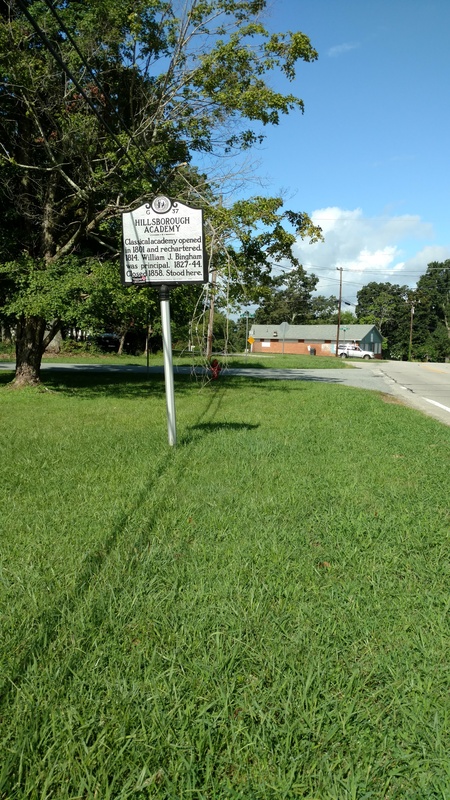 In 1845 the Caldwell Institute absorbed the struggling Hillsborough Academy, moving to the campus to escape a typhoid fever epidemic in Greensboro. The institute prospered for a time but closed in 1850. The following year Hillsborough Academy was revived by Benjamin R. Huske and Ralph Henry Graves. The school operated until 1858. The facilities were used by the nascent Hillsborough Military Academy from 1859 until 1860 while its campus was constructed.